About 8.7 in (22 cm); 1.4–1.9 oz (40–55 g). 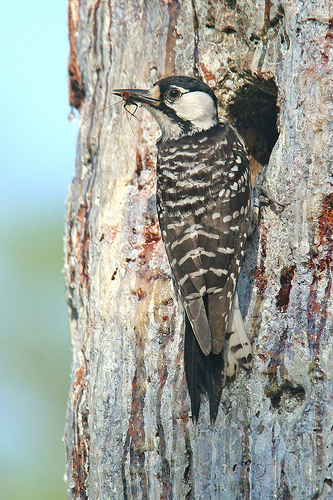 Medium blackand- white woodpecker; primary distinguishing characteristics include large white cheek patches with ladder back; males have several tiny red feathers between white cheek patch and black crown, but the red is usually concealed; females lack the red; immature males may have irregular red patch on forehead, immature females tend to have white flecks on lower forehead. 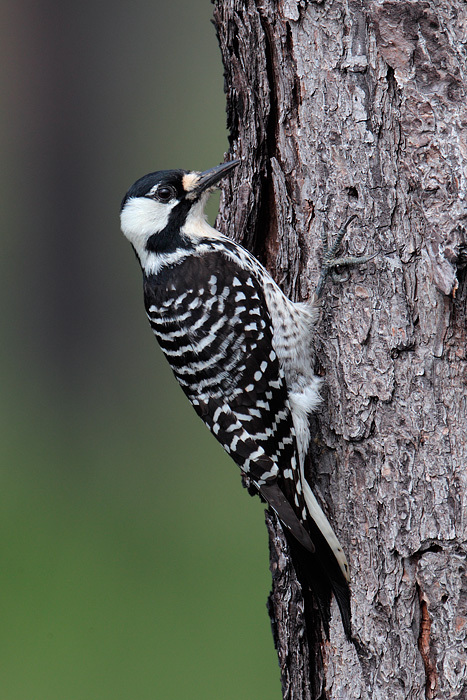 The red-cockaded woodpecker is a very social species that lives in extended family groups including one breeding pair, their offspring from recent nesting efforts, and males from earlier nesting efforts. The group forages over an area averaging about 200 acres (80 ha) in good habitat and more than 1,000 acres (400 ha) in poor habitat. Cavities are in living pines, usually below the lowest branch, in trees infected with the redheart fungus. 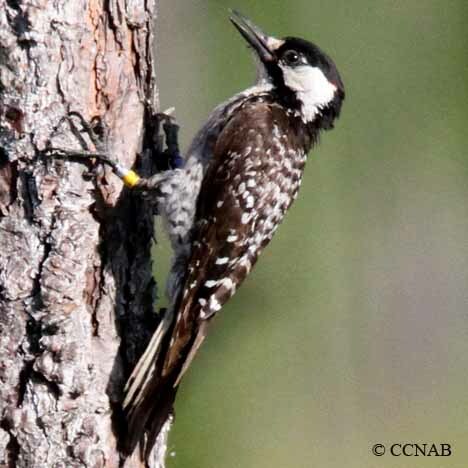 Cavities persist sometimes for decades and are used multiple years as nest and roost sites, inherited by males who remain with the group. 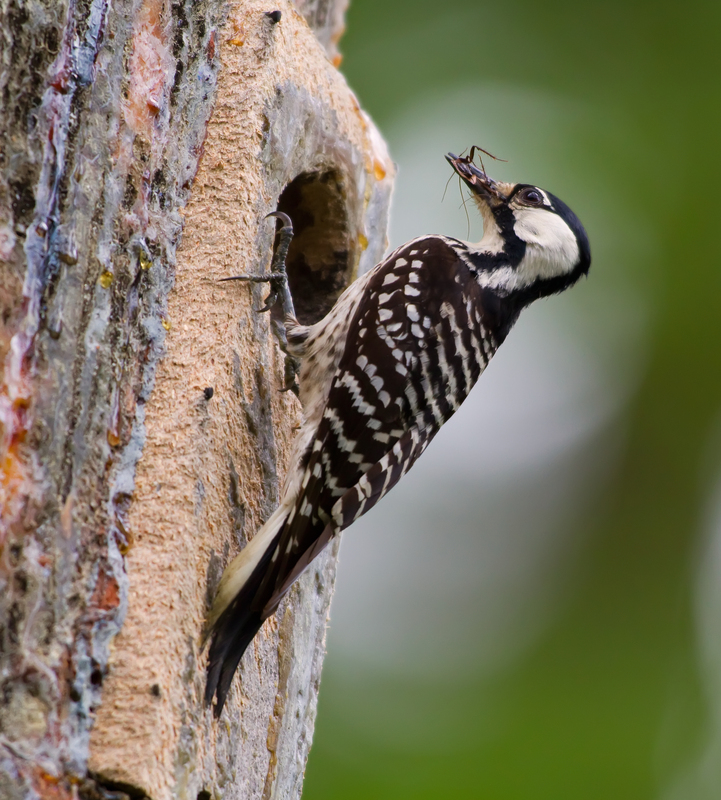 Birds peck tiny holes, called resin wells, above and below each cavity. These are continually worked so they provide a steady flow of sticky resin, which is an effective barrier against tree-climbing rat snakes (Elaphe). Monogamous, but a cooperative breeder; nest is in the roost cavity of the breeding male. Clutch size typically 2–5 eggs; incubation period 10–11 days; young fledge at 26–29 days; offspring cared for by both parents and helpers. 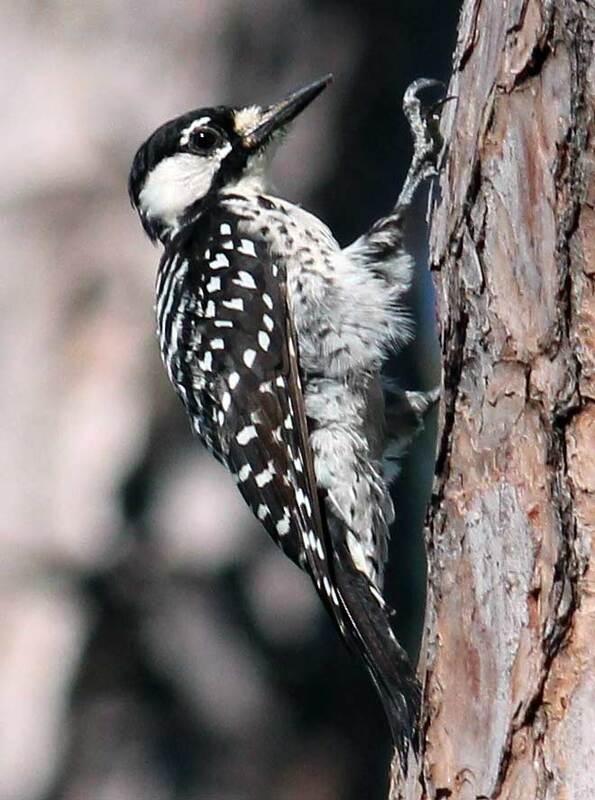 Needs of this species conflict with desires of forest industry to cut young pines; birders travel to the southeastern United States specifically to see this bird.